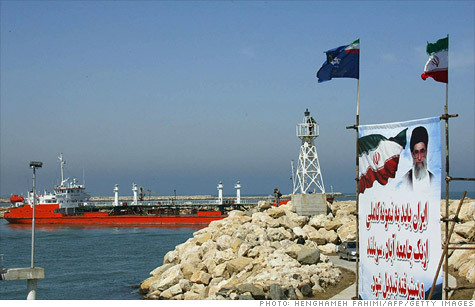 Sanctions ban the import of Iranian crude to Europe and also target Iran's central bank. NEW YORK (CNNMoney) -- The European Union announced tough new sanctions on Iran Monday, banning the import of Iranian crude and other items, in a move designed to increase pressure against Tehran's nuclear program. The sanctions ban the import of Iranian oil and restrict Iran's trade in gold and precious metals, as well as freeze certain Iranian financial assets, according to a statement from the EU. Of the 2.2. million barrels of oil Iran exports a day, about 18% is bound for European markets, according to the U.S. Energy Information Administration (EIA). The world consumes about 89 million barrels of oil per day. The sanctions have a grace period and allow current contracts to be executed until July. The grace period will allow European refiners to find new suppliers and Iran to find new buyers. The move, which was widely expected, follows similar actions by the United States and the United Kingdom. The actions are aimed at increasing pressure on Tehran to give up its nuclear program, which Iran says is for peaceful purposes but many suspect is intended to produce a bomb. The Iranian government gets about half of its revenue from oil exports, according to the EIA. Analysts have said that while the new sanctions are the toughest ever imposed, they still contain many loopholes. Iran is expected to still be able to sell its oil to places such as China, India and other Asian countries, but possibly at a discount of 10% to 15%. About 35% of Iran's oil exports currently go to China and India. Western leaders have been walking a fine line with Iran, working to come up with a plan that squeezes the country's finances yet doesn't result in a loss of Iranian oil exports, which could send crude and gasoline prices skyrocketing.